Get ready to be surprised by The Hague/Den Haag! This Dutch city is a wonderful alternative to Amsterdam, with cool museums, canal houses, a walkable historic centre, and even 11 km of beaches with stunning beach houses! Here are 15 cool things to do in The Hague to get you started! This is probably the most cliched ever way to start a blog post, but this time it needs to be done. If I say The Hague, what comes to your mind? If you asked me, I would say government buildings, the International Court of Justice, and that’s about it. 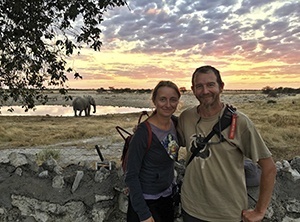 I imagined it as a drab, government-focused city, with not much to see and do – and naturally, I saw very little reason to visit. 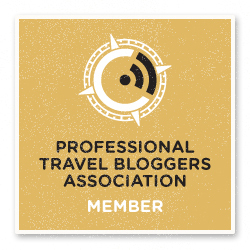 Then, in March, we spent three days in The Hague – and we were very pleasantly surprised. 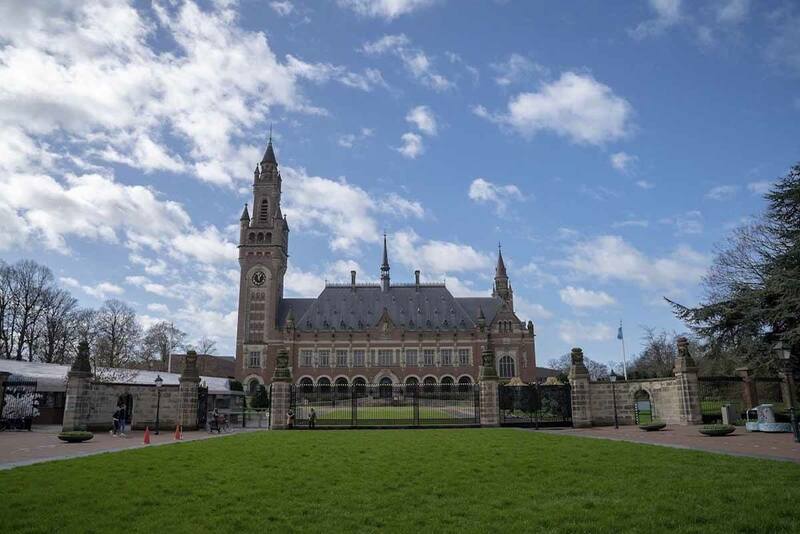 The city, known as Den Haag in Dutch, is packed with things to see and do – unusual museums, buildings, canals, and naturally, the famous Peace Palace, housing the International Court of Justice and the Permanent Court of Arbitration. With over tourism hitting Amsterdam more and more each year, The Hague is the perfect alternative to Amsterdam for a Dutch city break. To make matters even better, The Hague has 11 km of beaches. Yes, I had no idea The Hague was so lose to the beach – my bad! 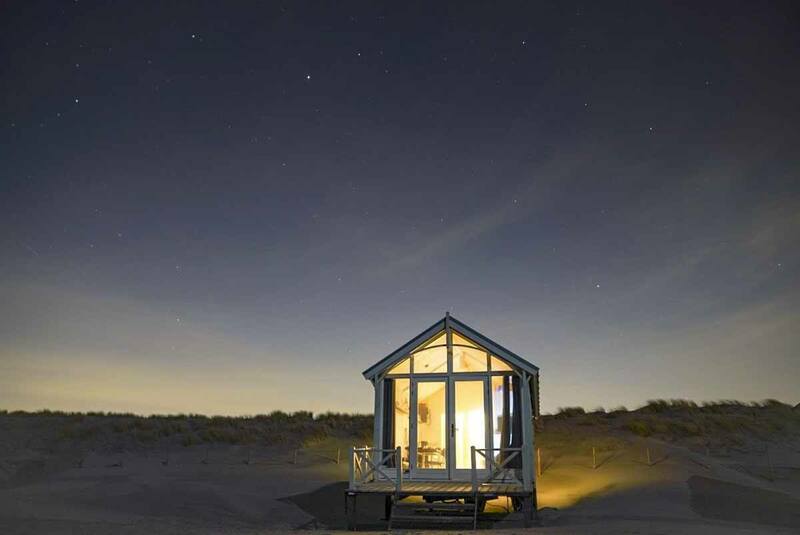 Would you like to stay here on the beaches of The Hague? Read on! I can’t say we’ve been lucky with the weather during visit to The Hague. The city is located in the southern part of the Netherlands, by the coast. You’ll find typically Northern/Central European weather – with cold winters and warm, but not boiling hot summers, and abundant rain year round. On top of that, The Hague’s coastal location also means that it’s windy pretty much every day. 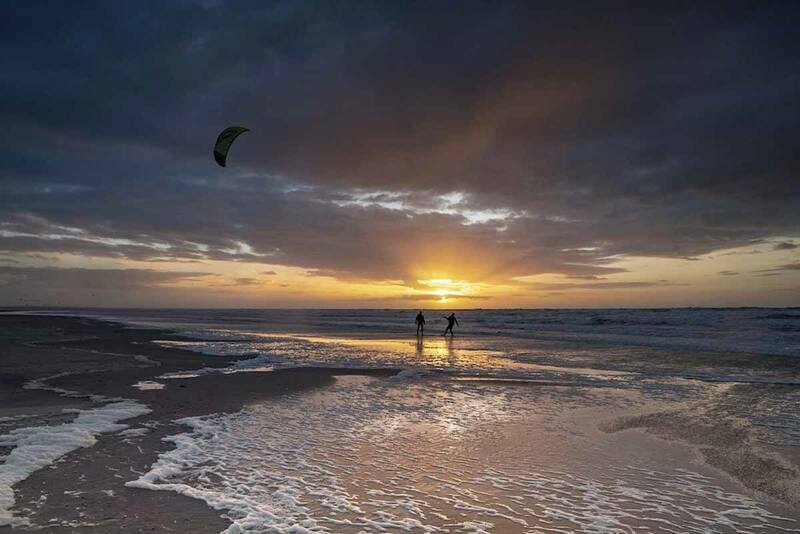 The windiest period of the year lasts between October and March, when the city beaches become a popular kitesurfing location, despite the cold. Typical Haagse weather in March! During our visit in mid-March, we had cloudy skies with frequent rain showers and a temperature ranging between 0°C at night and 12-13°C during the day, with very, very strong winds, touching 90 km per hour. However, this didn’t stop us from enjoying the amount of amazing attractions in The Hague! So, let’s have a look at 14 fun things to do in The Hague, even when it’s super windy! Want to explore the Benelux area more? Check out our 20 Fun Things to do in Luxembourg post! Would you like to discover The Hague in one fun minute? Here’s our cartoon video! ‘This is where my city was born’ said our guide Remco as we reached the Binnenhof, a complex of buildings right next to the Hofvijver, a small lake in the centre of The Hague. The Binnenhof started out as a small homestead by the lake, which was purchased by the count of Holland in the 13th century and slowly grew into a small keep. A few decades later, the count built the Ridderzaal, one of the largest non-religious Gothic buildings in Europe. Ridderzaal means ‘riders hall’, as its original purpose was to welcome riders visiting the court of the counts of Holland. What is now the city of The Hague grew around the Binnenhof. From residence of the counts it became the administrative centre of the country, housing the meeting place of both houses in the Dutch parliament, the Prime Minister’s office and the Ministry for General affairs. The Ridderzaal still stands proud, dominating the complex, and it is used by the Dutch monarch to deliver the annual speech opening Parliament. 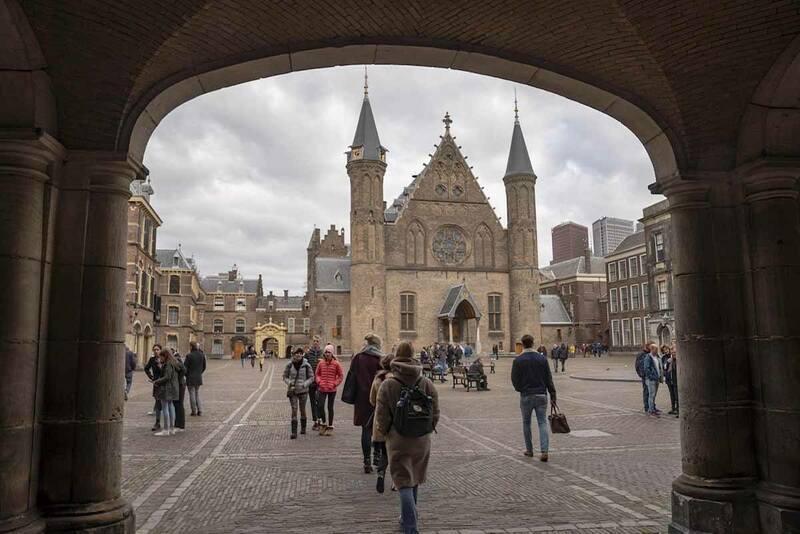 Visiting the buildings in the Binnenhof costs money, but walking around the complex is definitely one of the best free things to do in The Hague. Would you like to visit the Binnenhof? Here are some tours! Are you a castle fan? Discover the best castles in Luxembourg! Did you know The Hague also has canals? The city has about 10 canals, dug in the 14th century for transportation and defence purposes. However, The Hague is not known for its waterways, probably because similarly to many other cities in Europe like my very own Milan, many canals were filled over the 20th century to improve sanitation in the growing city. In 2004, part of The Hague canal system was uncovered, and now it is possible to sail or walk along it. If you want to go sailing, naturally you’ll need a ticket, but walking along the canals won’t cost you a cent, and it’s surely a great free activity to enjoy in The Hague. From there, head towards Maliestraat, right next to the most beautiful canal in The Hague. You can follow Nieuwe Uitleg, a road creating a ring around the canal, then turn right on to Hooikade. At the end of that street, cross the street and follow the canal on your left, running parallel to the Mauritskade. Keep walking along Mauritskade all the way to the end. Then, turn left until you get to a canal with a bridge with a bike covered in flowers, a tribute to a young girl who died in a bike accident. Follow that canal past Prinsessewal, until you reach the end. On your right there will be another short canal named Veenkade, where you’ll find bars and an ice cream shop that all have floating terraces on the canal. Can you imagine a better end to this canal walk? This itinerary will take you about 2 hours, depending on how often you stop for pictures, and it’s a wonderful free thing to do in The Hague! This was, by far and away, my favourite thing to do in The Hague. The Peace Palace is the reason why The Hague is known as the City of Peace and Justice – the complex was built around 100 years ago, to provide a home for the Permanent Court of Arbitration, established at the end of the 19th century to provide an alternative solution to war for disputes between countries. Construction was sponsored by the American steel magnate Andrew Carnegie, and the Carnegie Foundation still owns and manages it. 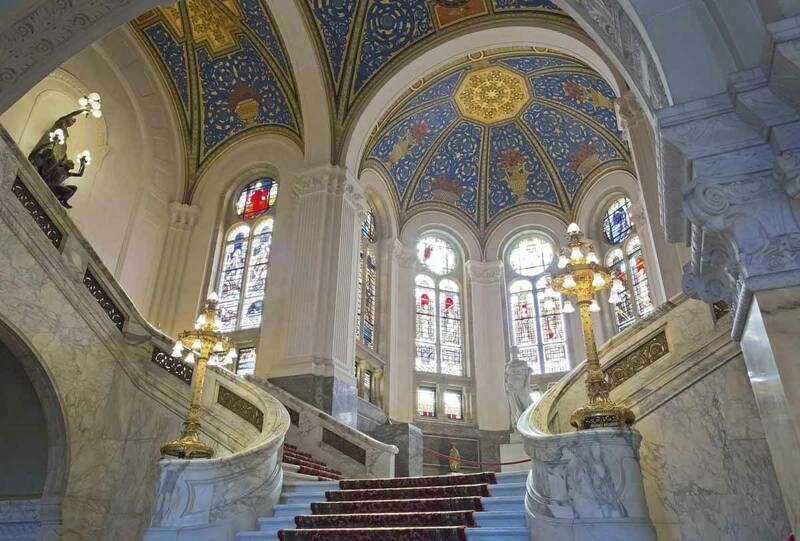 Nowadays, besides the Permanent Court of Arbitration, the Peace Palace accommodates the Permanent Court of International Justice, the Library of International Law, and the Hague Academy of International Law. We were lucky to tour the interiors of the Peace Palace. 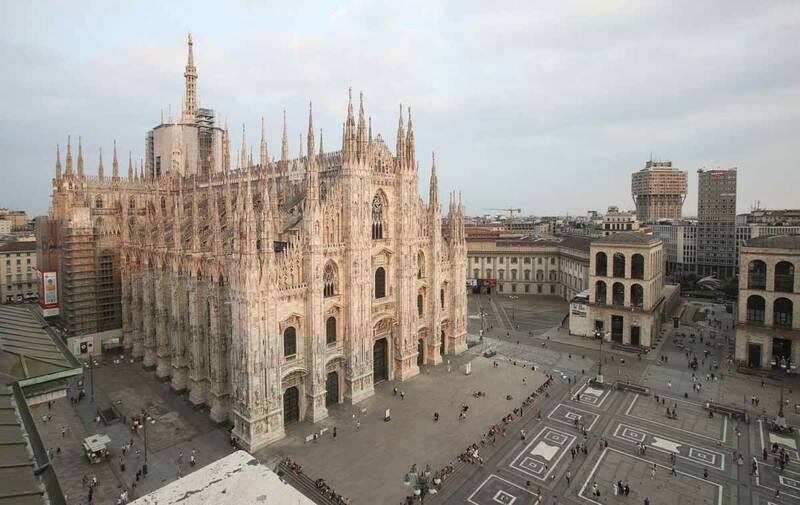 Tours last approximately an hour and a half and include a visit of the Permanent Court of Arbitration and the Permanent Court of International Justice, as well as the artworks located in the corridors and hallways, all gifts from various city governments. One of the coolest places is the Japanese Room, the secondary room of thePermanent Court of Arbitration, taking its name from the stunning silk tapestries gifted by the Japanese government. The Peace Palace can only be visited when courts are not in session. You can get info about dates and book tours on the official website – but please be aware that tours are often cancelled if court sessions are scheduled or moved last minute. However, you can always see the Peace Palace from outside for free. The imposing neo-Renaissance building is clearly visible through the fence, looking a little bit like Hogwarts. Don’t you think? Welcome to Hogwarts aka The Peace Palace! The Hague is a wonderful place to walk around aimlessly, getting lost its streets and marvelling at its architecture. The Hague is divided in two parts, one built on sand, and one built on clay. The two parts of the city are divided by Laan van Meerdervoort, the longest street in Europe. The richer people live on the sandy part, the northern half of the city, and call themselves Hagenaar, whereas the southern half of the city built on clay is home to Hagenees, working class people. A good place to wander around are the shopping streets around Spuistraat and Grote Marktstraat. You’ll find many department stores like HEMA, a Dutch institution, and upmarket de Bijenkorf. Right next to that there’s a cool shopping building decorated with Art Nouveau storks, the symbol of The Hague. 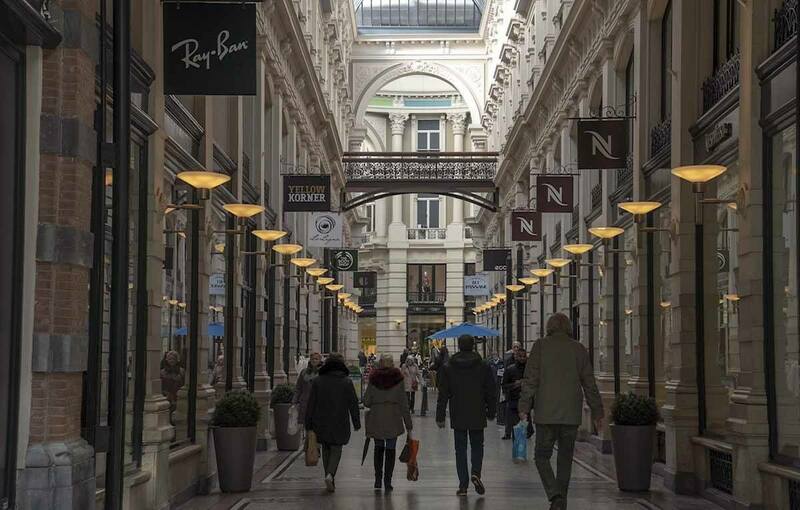 Another fun free thing to do in The Hague is walking down De Passage, the only remaining covered shopping arcade built in the second part of the 20th century in the Netherlands. De Passage was originally built to house luxury stores, and still remains faithful to this ‘upmarket’ soul. If you want a small souvenir typical of The Hague, grab some Hopje from Hop & Stork, one of the best coffee shops in town. Hopje coffee-flavoured sweets were born by mistake, after a coffee-loving baron was forbidden by his doctor to drink coffee, and tried to find a way to do it anyway. He left a mixture of coffee and sugar on the stove simmering for too long, until it hardened up into caramelised lumps. The result was so good, that he commissioned a local baker to recreate his ‘mistake’ – and from then onwards, hopje have become The Hague’s most beloved sweet export. The Hague is also unique in the sense that it has not one, but two central stations – both of which are really cool in a different way, and visiting them is another unusual free thing to do in The Hague. If you’re coming from Amsterdam or from Schiphol airport, more than likely you’ll be arriving at Den Haag Centraal, the largest of the two located right in the city centre. The station was recently renovated and it is now a modern steel and glass building, with a mini food court, as well as some cafés and restaurants on the upper floor. We especially liked Station Huiskamer, meaning ‘the station’s living room’, a cozy café with couches and working spaces, and a views over the trains. The second station is Den Haag HS, about 20 minutes walk from the centre, with trains to Antwerp, Brussels and other Dutch cities. The building dates back to 1843, when the station was opened. Den Haag HS is less busy than Centraal station, and worth visiting to appreciate the 19th century architecture of the station building. There’s also a spectacular royal waiting room, which can be visited once a month joining a guided tour. Are you a fan of train travel? Read about our winter rail journey from Finland to France! If it’s windy or rainy in The Hague, as it often is, there’s no need to worry about finding things to do – there are many museums to choose from! If you only had time to visit one museum in The Hague, we highly recommend the Mauritshuis, housing an impressive collection of Dutch Golden Age paintings. The best known and most popular artwork is undoubtedly the Girl With The Pearl Earring by Vermeer, but there are many more to see, including some impressive still lifes and paintings depicting daily life in the Netherlands in the 17th century. 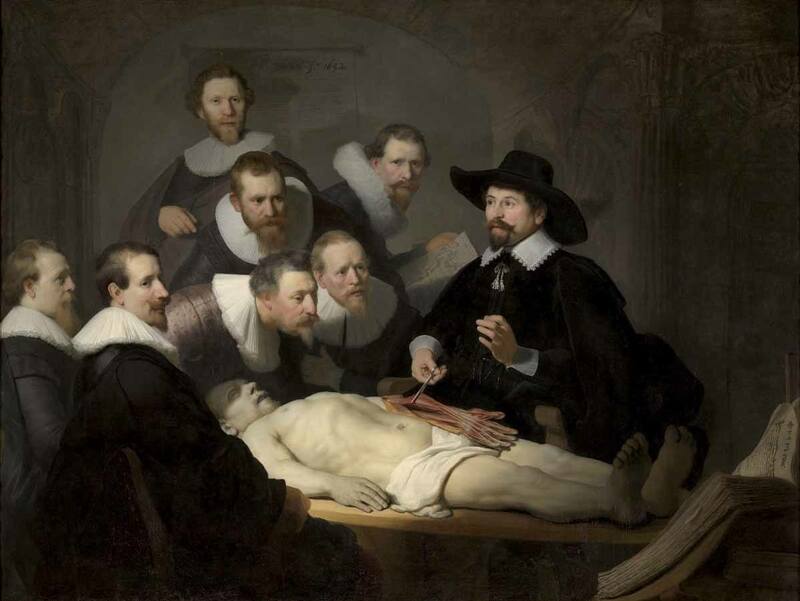 If you are visiting this year you can also visit the Rembrandt and the Mauritshuis exhibition, with all 11 Rembrandt paintings in the museum collection on show, including the famous The Anatomy Lesson. If you’d like to know more about the Mauritshuis collection, we recommend joining a tour – here are a couple! Even if the name Escher doesn’t ring a bell, you’ll be familiar with the Dutch graphic artist’s mathematically-inspired prints and illustrations. Escher in the Palace (Escher in Het Palais) is a museum dedicated to Escher’s artwork, located in a former royal palace dating back to the 18th century. 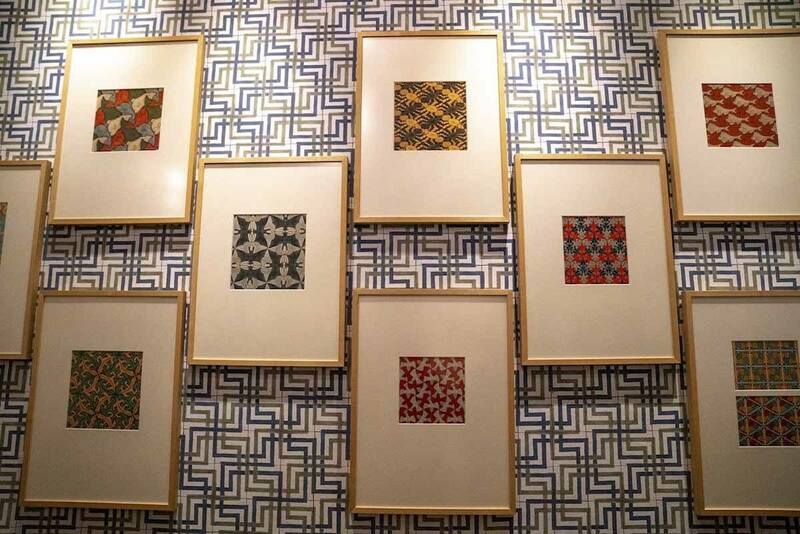 The exhibition displays original wood blocks used by the artist, as well as a selection of prints, including some of Escher’s earliest depicting Italian landscapes. The exhibition was designed especially to display Escher’s work – don’t miss The Waterfall, example of the artist’s ‘impossible perspectives’, the Drawing Hands, and the three Metamorphosis, with a sequence of tessellated images morphing into one another in a circle. Skip the line and get your Escher in the Palace ticket in advance! The Mauritshuis may be The Hague’s big ticket museum, and Escher in the Palace is definitely worth a visit for the scenic palace setting, but in my opinion the coolest museum in the Hague is Museum Voorlinden, a contemporary art gallery opened in 2016. Museum Voorlinden is set in a private estate, in a modern building with large windows providing plenty of natural light, really enhancing the artwork on display. Part of the museum houses temporary exhibitions – at the time of our visit in mid March, there was one titled ‘Less is More’, about minimal art, and an exhibition dedicated to Japanese artist Yayoi Kusama was due to open within a few days. 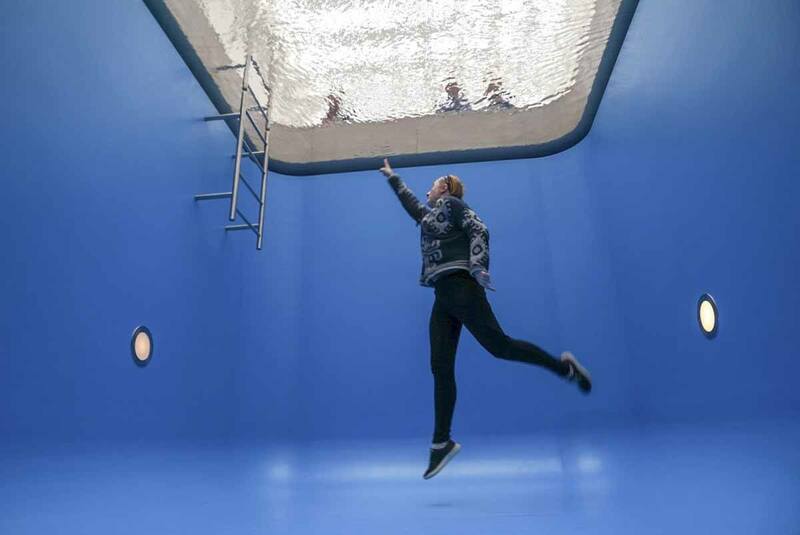 Yet, Museum Voorlinden is best known for its Highlights, a selection of large-scale, immersive art installations like Leonardo Elrich’s Swimming Pool, where visitors can access the bottom of the pool and see other visitors watching them from above, and Open Ended, a maze made of steel plates. Visiting Museum Voorlinden was definitely one of our favourite things to do in The Hague – don’t miss it! The long, sandy beach resorts of The Hague are probably what sets it apart from other Dutch cities. Where else can you spend the morning visiting museums, and then hop on the tram for an afternoon on the beach? 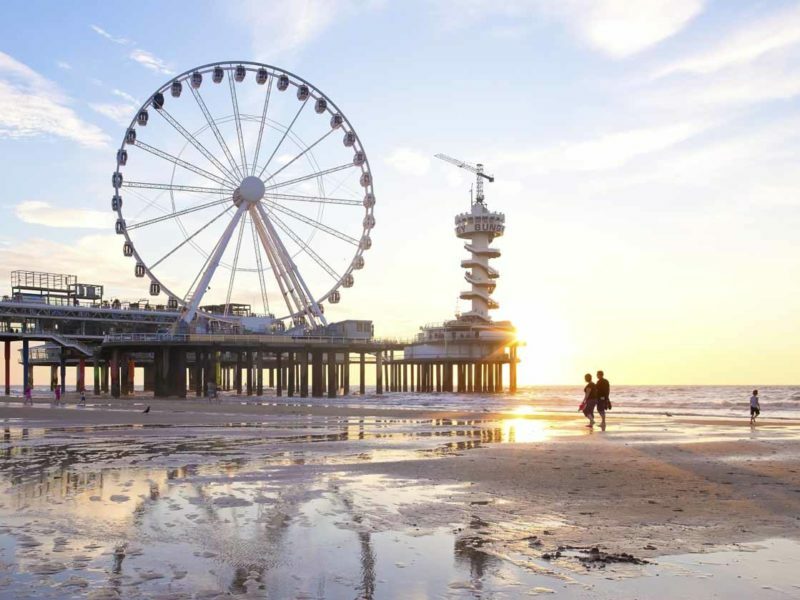 Beaches in The Hague cover a length of 11 km, divided between two different beach resorts – the first to be established and largest of the two is Scheveningen, about 5 km north from the city centre. Scheveningen is best known for its pier, opened in 1959 after an existing pier was destroyed during World War II. The pier was renovated in 2015, and it now includes a covered shopping centre with restaurants, cafés and entertainment opportunities. 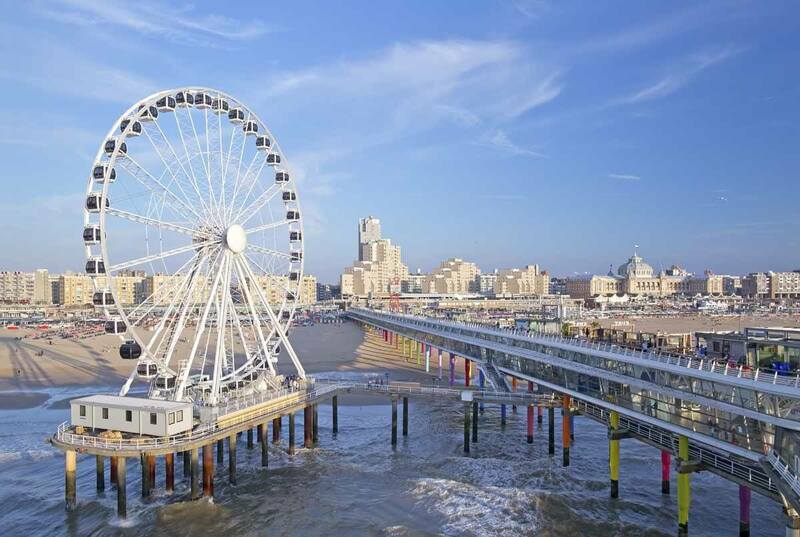 At the end of the pier you’ll find the Skywheel, the best known Scheveningen landmark. There’s also a bungee jump and a zipline, connecting the bungee platform to the upper pier deck. When we visited in March, Scheveningen was deserted, with only a few souls braving the wind and cold. In summer, beach bars line the promenade and you’ll find people skating, cycling and braving the chilly waves of the North Sea. You can also try your hand at riding the waves – book a surfing lesson! Scheveningen is indeed a happening place – if peace and quiet are what you’re after, you’d better head to Kijkduin, the smaller of the two resorts which is a little further from the city centre, surrounded by sand dunes. The vibe at Kjikduin is definitely more low-key and family friendly compared to Scheveningen. There are a few beach clubs, mostly cafés and restaurants, but don’t expect much action if you’re visiting in March as beach bars in The Hague are taken apart in winter and reassembled in summer – except for Havana Beach, open year round. 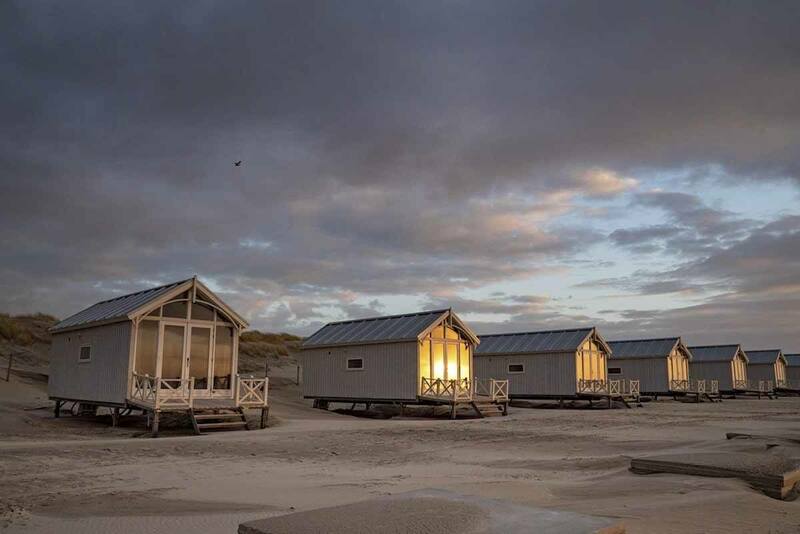 There’s also one more reason to visit Kijkduin, which is really one of the coolest and most unusual things to do in The Hague – but I’m not ready to reveal it just yet. Read on, and you shall find out! In the 1400s, The Hague wasn’t the peace and justice-loving city it is these days. The Prison Gate museum (Museum de Gevangenpoort) reveals visitors how the concept of crime and punishment evolved over the centuries, when justice wasn’t administered in courts, and confessions were extorted through torture. 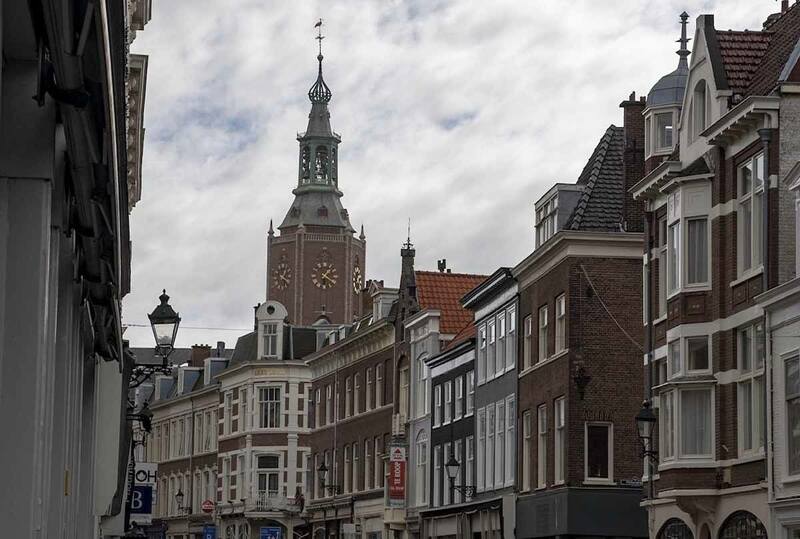 The museum is not far from the Binnenhof and includes the largest collection of instruments of torture, like branding irons, hand clamps and flogging benches, and the cell block where prisoners used to be incarcerated and tortured. This is not for the faint of heart, but it’s definitely a must if you’re looking for unusual points of interest in The Hague. Market lovers, did you know that Haagse Markt is the largest outdoor market in Europe? Besides its size, what makes this market special is the variety of goods on offer, including food from all over the world. It’s a great place if you’re looking for street snacks, with food reflecting the multicultural side of The Hague – within a few stalls you can find Dutch kibberling, Surinamese donuts, Turkish snacks, empanadas from the Caribbean and more. The market is located in between Transvaal and Schilderswijk, the two most multicultural neighbourhoods in the Hague. A market has taken place for centuries in the same location, and in the late 19th century it was already well known for exotic goods coming from the Dutch colonies and beyond. Nowadays, the market is a great destination for food lovers, but you can also find clothes, flowers, household goods and pretty much anything you can imagine. The Haagse Markt takes place four days a week – on Monday, Wednesday, Friday and Sunday, from 9 am to 5 pm. The Hague Tower (Haagse Toren) is the 5th highest building in The Hague, and it is nicknamed Het Strijkijzer (the Flatiron) as it was inspired by the famous New York building. You may expect this kind of building to house luxury offices or apartments – but this is when The Hague surprises you with its democratic soul, as the Hague Tower contains 300 studio flats for students and first-time property owners, and only 50 luxury apartments. 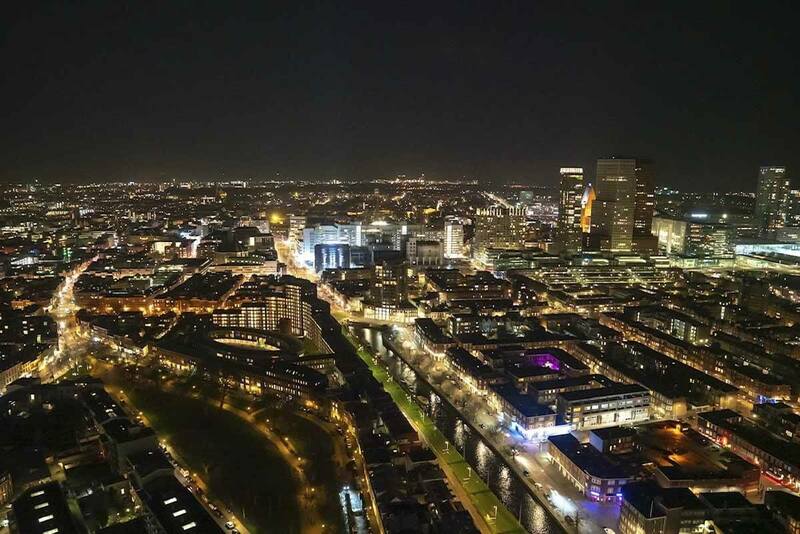 The 42nd floor of Hague Tower is also where you’ll find The Penthouse, the highest restaurant in the Netherlands. You can start your evening with a cocktail at the Sky Bar, then take your pick from the creative, international dishes found on the menu. Or better still, do what we did and opt for the Journey, a surprise menu with the daily specials. By now, you will have gathered that The Hague has 11 km of beaches, since I repeated it about three times in the course of this post. I loved all the things we did and saw in The Hague – seeing The Girl With The Pearl Earring, Escher’s artworks, visiting the Peace Palace, eating tasty food while looking at The Hague city lights from above… and more. Yet, my best memories from The Hague are from the Haagse Strandhuises (The Hague beach houses) on Kijkduin beach, our home away from home in The Hague. The beach houses are located on an isolated stretch of beach, surrounded by sand dunes, with the sound of the wind and waves singing you to sleep. The beach houses are compact, but they include everything you need to enjoy your stay on the beach, including heating, TV, super fast wifi, a small kitchen and even a cart to carry everything you need across the beach. The front of the beach houses is completely covered in windows looking out to sea, and there’s also a small veranda where you can sit and enjoy the view – if the wind doesn’t blow you away! To make matters even better, the beach houses are made with natural materials and powered by sustainable energy. Even when it’s super windy, the feeling of being surrounded by the elements is simply magical, and you’re guaranteed to have a comfortable night sleep. The Hague is only 52 km from Amsterdam, and the closest airport is Amsterdam Schiphol, only half an hour away by train. Travelling between Amsterdam and The Hague by train is super easy, with departures every half an hour from Amsterdam to The Hague central stations, with trains taking under an hour and tickets cost €12.20. There are even more frequent trains travelling via Leiden or Schiphol airport, but you will need to change trains. Rotterdam is also very close to The Hague, about 36 km away. Train between the two cities depart every 10 minutes, cost €5.10 and take less than half an hour. Many thanks to Stefan, Remco and Danielle from The Hague Marketing for welcoming us!